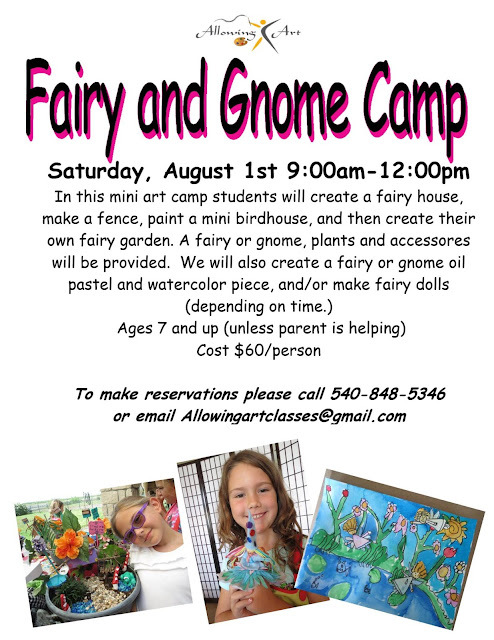 Allowing Art has another fun camp coming up. This mini-camp is taught by Teresa Steuber who has been an artist for many years. We've had the pleasure of attending a fairy garden class last year and it was so much fun. In fact it's still blooming in our back yard. She really knows her stuff! Kids can create a fairy or gnome garden from scratch. All supplies included. The camp is for kids age 7 and up. Your kids will really enjoy letting their inner artist out and being creative at the camp! E-mail Teresa today to register or call 540-848-5346.